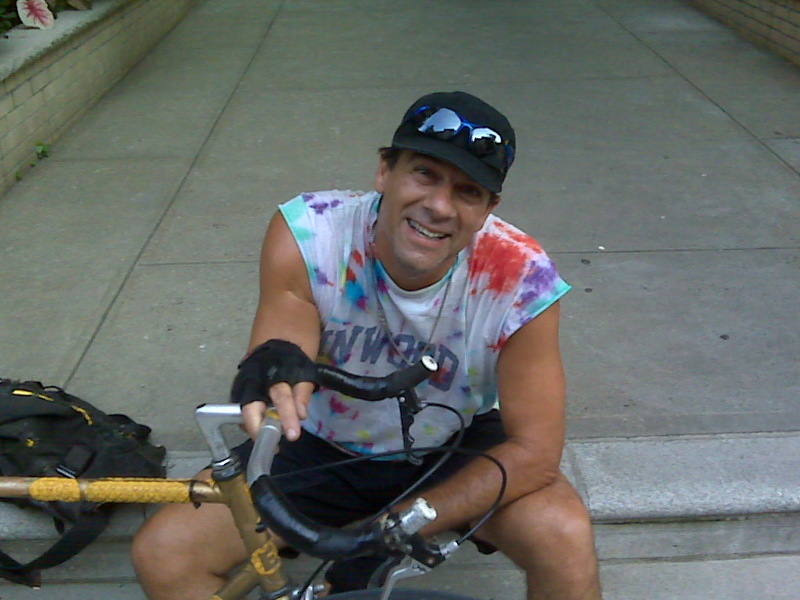 “Our streetwise Dionysian godhead,” is how one veteran of the 1987 Midtown bike ban protests described Stephen Athineos, who died yesterday of a heart attack in Inwood, where he lived. Without his charismatic field generalship, the rolling demonstrations that mesmerized the city in the weeks after Mayor Ed Koch disclosed his intent to ban cycling on Fifth, Madison, and Park Avenues might have sputtered and died. Without that “bicycle uprising,” as I’ve called it, the open eyes with which New Yorkers regarded bike messengering and all bicycling that summer would have remained closed. And the lawsuit that blocked the ban, with Steve as a plaintiff, might have been summarily tossed out of State Supreme Court as an irrelevance. Steve wasn’t a figurehead in the sense of a “nominal leader without real power.” But he did fit another sense of the word, one that denotes “a bust or full-length figure set at the prow of a sailing ship.” Steve was, that whole uproarious summer, both seemingly carved from stone and alive as any human could be, with a dancer’s grace, an athlete’s swagger, a cascade of tumbling hair, and a forehead brimming with intelligence and conviction. 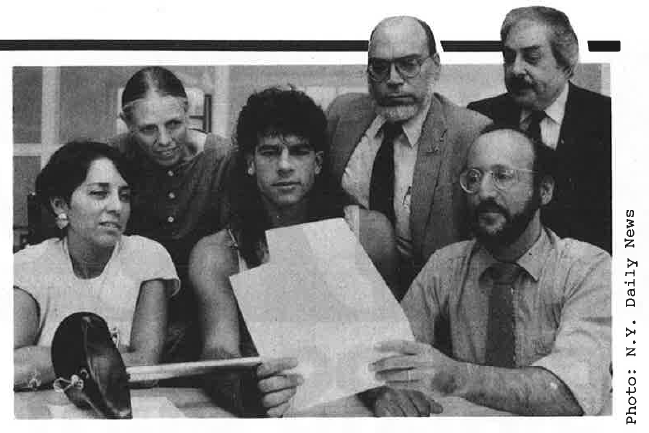 Steve Athineos, center; author Komanoff, seated right; with other bike ban plaintiffs and attorney. Transportation Alternatives assuredly did not direct the uprising against the ban. Leadership came from the ranks of those whose livelihood was directly threatened, most notably in the person of Steve Athineos, a 31-year-old cycle courier with training in communications. Athineos had a commanding street presence, a gift for truth-telling sound bites, and street cred built from three years of messengering. All this was apparent “in Steve’s character, in the way he communicated, in how he rallied the forces,” as Charlie McCorkell, a past-president of TA and owner-founder of Bicycle Habitat bike shops, told me today. That we should ride en masse from “messenger park” on Houston Street to Central Park, taking up the full width of Sixth Avenue, was a given. But it was Steve who had us ride no faster than a strider’s pace so the press could keep up with us, so people on the sidewalks and hanging out office windows could read our signs and cheer us on, so we could fill the street all evening long, and so pedestrians could safely cross and see the messengers up close as young, hungry, and vulnerable (not just badass). And it was Steve who sizzled sweetly in TV and radio clips and laid out, in his low-key but direct style, that scapegoating cyclists for the city’s failure to deal with traffic was both unfair and insane. So striking was Steve’s command — of the issues, the streets and the troops — that McCorkell secretly arranged with Steve’s boss to pick up half his salary so he could devote time to organizing. It worked. The demonstrations rolled, the NYPD kept its distance, coverage turned positive, editorials rolled in, Koch was put on the defensive, TA got a cut-rate deal with a law firm, the lawsuit was filed. That the ban was quashed on a technicality (the city’s failure to publish “official notice”) was beside the point. We had won in the streets. The city chose, wisely this time, to put the ban to rest. Steve and organized bicycle advocacy largely went separate ways afterwards. The energy unleashed in fighting and stopping the bike ban propelled TA into a higher orbit that led to other victories not linked directly to bike messengering. Steve lent his prestige and aura to the cause, but he wasn’t much of a joiner and was busy making a living. He started his own courier service, Mothers Messengers, on the Lower East Side, but like most of the business it was eventually overwhelmed by the digital revolution. Steve was devoted to his wife Sheila Cobb and a doting father to Madison, 20, and Lexington, 16. He was 59. Did Steve Athineos really save NYC cycling? I believe he did. Steve didn’t just stop the 1987 bike ban. He made it our launching pad to revive urban bicycling. Putting his body on the line, with fire and intelligence, he energized the generation of bike activists that began carving out space, literal and figurative, for cycling in New York and that seeded bike advocacy in San Francisco, Chicago, Toronto, and other cities. Steve had a large ego and a larger heart. I owe him so much. We all do. Mary Frances Dunham’s LAB mag piece, “Fifth Park and Madison,” can be read in TA’s online version of the Bicycle Blueprint. The 38-minute video of the same name, by Dragan Ilic and Charles M. Fraser, with terrific interviews and riding shots of Steve Athineos, is on YouTube. Steve. I could never thank you enough and pray I can thank you even more. Wow, thank you for that Charlie. I never pretend to know everything about cycling history in New York City because, really, who can? But here’s one man I never knew of and we are all lucky to live in his wake. There’s a lot of people out fighting for cycling rights, some high profile, some who might just write the occasional letter to the local rep. or convince a neighbour that cycling is OK. But some really do stand out, and most especially those in the 80s. Clearly this man was one of those! Thank you Charles. I knew Steve as one of his messengers. Great dude. Heart of gold. We lost one of the good ones today. As a life-long childhood friend of Steve’s I can testify to what a “lover” Steve was of his family and friends, of life itself AND yesterday with Steve’s untimely passing, the world got smaller. He was proud of his role saving NYC biking and the livelihood of his profession. I am not seeing the link. “I just want to be loved, is that so wrong?!”? Harvey Fierstein, Torch Song Trilogy- You are loved Steve, and it feels so right. Thank you Charlie, for this moving obituary. I wish I had known him. I’m sorry for his family’s and all of our loss. Great piece, Charles. Steve sounded great — very sorry for his family and friends. glad i was there for it all.Up until a few year ago we’d still see each other out there after all these years. RIP …Do what u love doing, whatever it is! I remember being so angry at the ban, but unable to take part. Thank you Charles for calling attention to a soldier in the cause for a bikeable city. Here’s Steve in Carl Hultberg’s epic shot of a messenger bike lift that summer. We need more of this real activism. I didn’t know him by name, whenever I took the subway to work, in the second car of the A train heading downtown from Inwood, there he was sitting in the end of the car, reading the paper, with his gold bike rubber-banded to the pole, a tattered stuffed animal attached to the seatpost. We used to talk about biking in NYC in the 1980s. May he rest in peace. Having no bell is not a minor infraction, especially on bike couriers. This is how pedestrians get hurt, by not knowing a bike is approaching. whistle or a ‘hey’ is rather effectve way to get pedestrians attention, even a double lick of brakes calipers works. bells are useful but there are plenty of effective substitutes. Clicking the brakes is my preferred method. I think it works better than a bell or horn. Pedestrians are desensitized to bells or horns with all the unnecessary honking going on. MrBlifil is the problem. As other posters have noted there are other methods of letting people know that they are in the way, such as just shouting “Yo! !” distinctly. Also, he says it is not a minor problem. That was not the response I got from the officers who gave me the tickets. They just sort of grinned in acknowledgment of the stupidity of the violation. We also grinned rather listlessly, accepting this “No bell” prize as the cost of living on the edge of society. a place that this Blifil idiot has never been near, obviously. In my softest voice, lest he hear me approaching on my bike, let me just murmur that Mr. Blifil is about to run into the metaphorical bike of reason. He is an idiot. A great neighbor to all of us at 251 Seaman Ave. His smile and humor and infectious love of life will always be missed. They say they take the good ones early – in Steve’s case that is all too true. Love to his family, and may he continue to watch over them from his new vantage point. Bless you Steve. Thanks for such a thoughtful and wonderful explanation of Steve’s enormous contribution to cycling in NYC. He made a difference. Thanks for the reminder that one person matters and that we all can make a difference. I knew Steve from afar as a charismatic formidable competitor. My heart and prays go out to Steve’s family. Steve was a tax client of mine and I just found out that he had passed after I received a call from a lawyer. We had met maybe three weeks ago for a tax planning session and I hadn’t heard back from him and I was planning to call him when I got that call. He was really a good guy and I always enjoyed meeting with him. May he RIP. Yes, reaching for a bell is dangerous. So sorry to hear of Steve’s passing, I knew him well from Washington Square park in the ’80s. He was a great guy and major bike advocate, it was a pleasure to work with him as a bike messenger my deepest condolences to his family.